Set your reels spinning to destroy the towers and collect the bonuses along the way. There are 5 different ways to win, so see if you can spin your way to the top! Spin the reels to destroy the towers to win. Collect symbols from the reels to unlock the Bonus Games or win Instant Prizes. At the end of the game, if you haven’t won you can choose to buy extra spins to win. Set your chosen bet amount – decide how much you want to wager on a single play. Remember, the more you bet – the more you can win. Spin the reels – After each spin each of the 6 reels will show a number of blocks to destroy, a bonus symbol or even an instant prize. 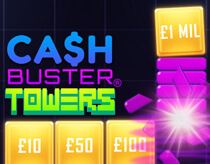 Maximise your chances – if you have fully destroyed a tower, won in a minigame or collected an instant prize, you win the corresponding amount. If you haven’t won, you can choose to continue your game up to three times for another chance at a prize!